A hamstring injury can be pretty painful. They can occur quite suddenly, while you are running or working out comfortably, causing severe pain. Many times a hamstring injury is recurrent. Because you make use of your hamstrings constantly while running, you may want to read up on hamstring injuries so that you know what to do about them. OK, some anatomy. The hamstrings are comprised of semi-tendinosus muscles and semi-membranosus muscles that are located at the inner part of the backside of your thigh. The biceps femoris is located on the outer side of the back of your thigh. These three muscles, the semi-membranosus, the semi-tendinosus, and the biceps femoris make up the hamstrings. The hamstrings run across both the knee and hip joints. The symptoms of sciatica and a hamstring injury are very similar so the diagnosis is often confused. Especially if you are the one doing the diagnosis. Suffering from a hamstring strain? Then the pain will likely be in the center of your thigh. Suffering from sciatica? Then the pain will be felt on the outer thigh. The sciatica will cause pain throughout your hip, in the lower back, all the way to your feet. There is a very simple test that can help you determine if you have pinched sciatica. Lie down on your back. Simply raise the leg that is causing pain, keeping the knee straight. It is likely a hamstring strain if this hurts. To rule out sciatica, have somebody flex the foot, bending the foot towards the knee. If this causes pain then it is likely sciatica and not a hamstring injury. How is a Hamstring Injury Caused? Hamstring injuries are often caused by over extending your leg. Running along a sloped road or a steep bank are notorious for causing hamstrings strain since the muscle is overstretching to keep your balance. If you have a hamstring injury, you will probably have difficulty maintaining your normal running pace and might have to shorten your normal running stride. As the hamstring deteriorates, you may have a hard time extending the leg without feeling intense pain. I recently had a painful hamstring injury when playing squash. I did not think it was necessary to warm up before the game, I figured I would just get warmed up in the first few minutes... Unfortunately one of my first moves involved a quick, sudden stretch forward to get to a ball. This was too much for the muscles which I almost felt snapping. That caused me severe pain for a week, and two and a half weeks of running! So, how do you treat a hamstring injury? The initial treatment is application of ice. Use of the commercial ice packs work best for targeting focused pain relief. Taking ibuprofen, or any other anti-inflammatory, will help to reduce the associated swelling. Depending on how serious your hamstring injury is, you may be able to continue your running. It is better though to be cautious and give the hamstring some time to heal properly. How to prevent a hamstring injury? Well, it is important to properly warm up the muscles prior to running or working out. Although everybody needs to make up their own mind, I do a warm-up via just easy running. I do not do stretches before the run. Stretching cold muscles is far worse than not stretching at all. More and more research shows that stretching before a running workout will actually not help prevent running injuries. However, stretching after your workout is far more important. Also see my running stretches page. This Hamstring Compression Wrap boasts a dual strap attachment which helps to alleviate conditions related to hamstring injury related pain or tear. The two hook-and-loop closures of this wrap help to control the compression level. 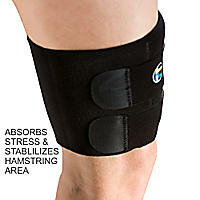 The Neoprene Thigh Sleeve provides moderate compression, support and warmth for groin, hamstrings injury. 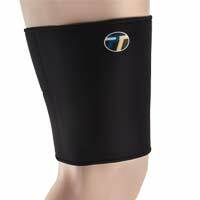 Besides, the neoprene insulates and absorbs body heat for therapeutic warmth which helps you to reduce your pain and increase your healing process. Hamstring injuries are painful and can impact your running. It is best to implement a proper warm up routine before your workout and to spend the time to cool the muscles at the end of your run. Athletes agree that it is much better to prevent these injuries than to treat them.